Search and rescue (SAR) dogs are trained to find missing people, to notify their handlers when they’ve located lost or missing people, and to take the handlers to those people. How are those behaviors trained to the level of proficiency necessary to achieve the important goals? Although the overall assignment is certainly impressive, it’s simpler to view each task as individual elements of the job, or simple behaviors connected in a chain. Note that these SAR terms and cues are used by the humans to discuss each step of the process. The actual cues for the dogs are either environmental cues or the previous behavior in a chain of behaviors. For example, even though the handler may say “show me” when the dog reports back after finding a subject, the dog’s trained indication to the handler actually becomes the cue for the dog to return to the subject. Novice search-dog handlers usually believe that searching for and finding the subject are both the most important, and the most difficult, skills to teach. It’s true that this training is tricky, and that most of a handler’s time with the dog is spent practicing the search for the “find.” But, the most crucial steps of search and rescue actually follow the find. A search dog works independently, and often at a considerable distance, from the handler. Despite this potential distance, the dog must be able to indicate to the handler when a subject has been found. Therefore, the “report” and “re-find” elements, the dog’s indication, are the most essential behaviors to teach in the chain. Since the success of the mission often depends on the dog being able to communicate to the handler that the subject has been found, the indication needs to be specific, clear to the handler, and performed easily under pressure. Experienced SAR dog handlers say that the report and re-find, critical to success, are the most challenging behaviors to train to consistency. For that reason, they are the behaviors I teach first, no matter what search environment or scenario a dog will face. Experienced SAR dog handlers say that the report and re-find are the most challenging behaviors to train to consistency. Across the various search environments there are differences in how a dog is asked to report, and if a dog is required to re-find. 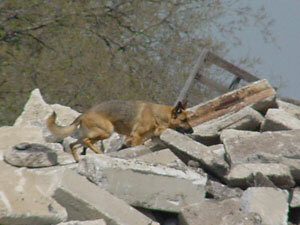 In FEMA disaster work, the dog remains as close to the source of the scent as possible and barks into the scent source to both report and indicate a find. In Colorado, the state with the highest number of avalanche-related deaths, we also train our dogs to stay as close to the source of the scent as possible following an avalanche and to dig/bark to report and indicate a find in the snow. However, in wilderness search, the preference is for the dog to return to the handler to indicate the find, and then to take the handler back to the subject. I build these task-specific requirements into the indication behavior. All indication behaviors can be trained with the same protocol whether or not the dog is required to return to the handler. 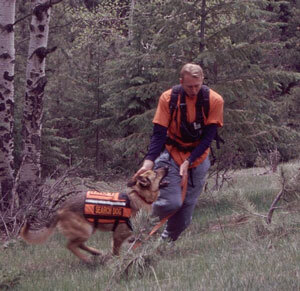 A single behavior can play multiple roles for a search dog. In fact, indication behaviors can be trained for separate purposes and applied in different ways, depending on the circumstances of the search specialty. As just one example of training a desired indication, assume the trainer wants the dog to make contact with the subject, return to the handler, and sit in front of the handler to indicate that the subject has been found. This assignment requires only two behaviors, with three distinct functions or meanings. The two behaviors are “sit” and “target” and the three functions are report, indication, and re-find. Click and toss the treat to the 12:00 position to move the dog away from you, and to reset the dog at the same time. Delivering the treat at this position also encourages the dog to sit in front of you when it returns. Put the sit behavior on cue using “sit” or any other verbal cue you’ll remember. Teach the dog to target your open hand with its nose. When the dog is positioned correctly, click and toss the treat to the 12:00 position to move the dog away from you, and to reset the dog at the same time. As the dog moves toward you, open your hand in front of you but close to your body. Put the nose target on cue using “touch” or any other verbal cue you’ll remember. Build distance gradually by moving your hand farther from the dog’s nose incrementally. Build fluency for distance using a nose touch. Enlist a friend (“the subject”) to stand next to you and give the “touch” cue. The dog should touch the subject’s open hand in front of the subject’s body. Each click/treat indicates success to the dog. The timing of the click is very important information for the dog. Therefore, if the person playing the subject isn’t an experienced clicker trainer, I (the handler) can do all of the clicking (whenever the dog touches my hand OR the other person’s hand). Regardless of who clicks, it’s important for the person whose hand the dog touches to deliver the treat. When treats are delivered by both the subject and the handler, the dog keeps moving between the two people to receive the valued reinforcement. Regardless of who clicks, it’s important for the person whose hand the dog touches to deliver the treat. The subject says the old cue “touch” and opens a hand. The dog touches the subject’s hand; click/treat. Encourage the dog back to the handler. Repeat until the dog begins to respond to the new cue “show me” by leaving the handler and going to the subject. Gradually increase the distance between the handler and the subject to build fluency for distance, making sure the dog remains enthusiastic. The dog sits in front of the handler, click/treat. The dog touches the handler’s hand and sits in front, click/treat. The dog leaves the handler to touch the subject’s hand, returns to the handler, and sits in front, click/treat. Decrease your criteria for distance between the handler and the subject again, so that the dog remains successful while you are building the chain. The subject should hold the dog a short distance from the handler. The dog runs to the handler and touches his or her hand. The dog sits in front of the handler. The dog runs back to the subject and touches the subject’s hand, receiving a click/treat. At this point, the handler runs with the dog toward the subject to deliver the treat, being careful to not overwhelm the dog with excitement. This chain is simply the report, indicate, and re-find chain, a chain of simple behaviors linked to accomplish a critical job. Once a dog finds the subject in this example search, the dog returns to and informs the handler, and then takes the handler back to the subject. Remember that while dogs’ indications vary according to the dogs, handlers, and scenarios, any behavior used to indicate information can be taught using this same training protocol. Service dogs perform essential functions, providing amazing and sometimes almost unbelievable assistance in crisis situations. Preparation and training for these impressive animals is key. For search and rescue dogs, the indication and re-find skills are the most vital, enabling the dogs to execute their jobs smoothly, effectively, and predictably. A clicker training protocol that links together simple behaviors solidifies those skills, and enables many SAR dogs to complete, and communicate the results of, successful and often life-saving searches. 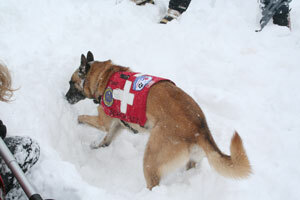 Angela Eaton, BA, KPA CTP, has been training and working search and rescue dogs in Colorado for 25 years. She and her dogs have certified and worked in avalanche, trailing, and air scenting, and incorporate human remains detection in all their work. Angela is the author of A Guide to Search and Rescue Dogs. She crossed over to clicker training while training her current search dog, and now uses the clicker for all of her dog training. Angela was the very first graduate of the Karen Pryor Academy Dog Trainer Program!